My next TotT article will focus on flashlights. During our first few outings, we inevitably found ourselves needing flashlights. We headed to the local hardware store and picked up a couple cheap LED based flashlights, and they seemed to do the trick for awhile. But I have a few gripes with most LED based flashlights. After a short amount of usage, they all tend to develop a flickering problem. If the flashlight moves in the wrong direction, the light will intermittently cut out. I wonder if this problem has to do with the fundamental difference between a diode based light, and a filament based light. A filament (traditional) bulb has to heat up and cause the filament to glow. This means that it’s still glowing while it cools down. Perhaps traditional flashlights also have intermittent cut-outs, but they aren’t detectable because the bulb doesn’t cool off as fast as an LED? What ever the cause of flicker, the other thing I dislike about all (it seems) flashlights these days is their insistence on using three AAA batteries in a strange cluster case. What engineer thought it would be good to use low capacity batteries in a cumbersome carousel cartridge? Not only have I had multiple of the carousels break, but the AAA’s hold enough capacity to light 1 or two adventures before going dim. Though this may sound like an advert for Maglight, I assure you I wasn’t payed by them! After growing tired of our cheapo lights, I decided to splurge on a better adventurin’ light. I picked out the Maglight 3D LED. No, the 3D doesn’t mean it’s got some kind of third-dimension gimmick. It uses 3 D-batteries – and they stack cylindrically in the light, no messy plastic carousels here. The best part of this light, though, is the volume of light it outputs. Compared to our previous lights, this thing is a beast. When I had mine on, my urban-ex buddie’s light was useless – it couldn’t add any light to the darkness, it was completely overpowered by the mag. The added bonus of the Mag light, is that it can be used as a blunt mele weapon in case you encounter meth/crack riddled crazies squatting in the places you explore. Now I’m not saying you should get a maglight, but you should get a maglight. While it’s often desirable to cheap-out on equipment, its often better to get the best you can from the get-go. Otherwise you’ll end up paying twice when you upgrade later. The three main supplies I use regularly whilst urban exploring are my p100 mask, my flash light, and my water proof boots (future article coming). All can be obtained for under $100, so there’s really no reason not to get the best tools available. 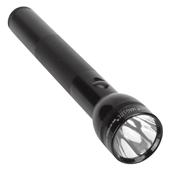 Considering we rely on our sense of sight the most (especially while traversing unknown, and often dark locations), it only makes sense to get a quality flashlight. I went with the maglight route, but if you know of other flashlights that you think are better feel free to send me a message, I’d love to hear it!